Michael Rubens Bloomberg KBE (born February 14, 1942) is an American businessman, politician, author, and philanthropist. As of March 2019, his net worth was estimated at $60.0 billion, making him the 8th-richest person in the United States and the 9th richest person in the world. He has joined The Giving Pledge, whereby billionaires pledge to give away at least half of their wealth. To date, Bloomberg has given away $8.2 billion, including his November 2018 $1.8 billion gift to Johns Hopkins University for student aid — the largest private donation ever made to a higher education institution. 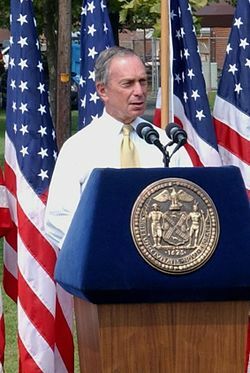 Bloomberg was frequently mentioned as a possible centrist candidate for the U.S. Presidential elections in 2008, and 2012, as well as for Governor of New York in 2010. He declined to seek either office, opting to continue serving as the mayor of New York City. His final term as mayor ended on January 1, 2014. ^ a b "Michael Bloomberg". Forbes. Archived from the original on January 6, 2018. Retrieved January 6, 2018. ^ "About Mike Bloomberg". mikebloomberg.com. 2015. Archived from the original on July 12, 2016. Retrieved July 31, 2016. ^ Flegenheimer, Matt (2014-10-06). "Bloomberg Named an Honorary Knight". The New York Times. ISSN 0362-4331. Retrieved 2018-12-26. ^ Banjo, Shelly (2010-08-05). "Mayor Pledges Wealth". Wall Street Journal. ISSN 0099-9660. Retrieved 2017-04-22. ^ a b Anderson, Nick (18 November 2018). "Bloomberg gives Johns Hopkins a record $1.8 billion for student financial aid". The Washington Post. Retrieved 18 November 2018. ^ CNN, Devan Cole,. "Bloomberg re-registers as a Democrat, saying the party must provide 'checks and balances'". CNN. Retrieved 2018-10-10. ^ "Michael Bloomberg". Encyclopædia Britannica. ^ Harris, Elizabeth A. (2011-06-20). "Charlotte R. Bloomberg, Mayor's Mother, Dies at 102". The New York Times. ISSN 0362-4331. Retrieved 2017-10-13. ^ "10 Fun Facts about Johns Hopkins University | AdmitSee". www.admitsee.com. Retrieved 2019-03-18. ^ a b "How the Bloomberg Terminal Made History--And Stays Ever Relevant". FastCompany.com. 2015-10-06. Retrieved February 11, 2016. ^ "Michael Bloomberg". Forbes. Retrieved 2019-03-27. ^ "Citizens Union/NYPIRG Forum on Term Limits Tonight". mas.org. Archived from the original on 2012-01-06. ^ Cooper, Kelly-Leigh (2018-02-18). "American teens demand 'Never Again'". BBC News. ^ a b Burns, Alexander; Ember, Sydney (2018-09-17). 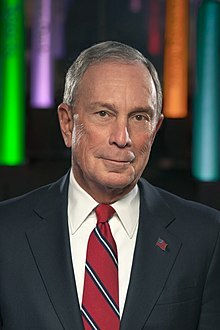 "Bloomberg May Run for President as a Democrat. Some of His Views May Cause Him Trouble". The New York Times. ISSN 0362-4331. Retrieved 2019-01-21. ^ Riggs, Mike. "2 Unpublished Studies Say Stop-and-Frisk Doesn't Work". CityLab. Retrieved 2019-01-21. ^ Smith, Dennis (2011-08-23). A Decade of Hope: Stories of Grief and Endurance from 9/11 Families and Friends – Dennis Smith – Google Books. ISBN 9781101543511. Retrieved November 5, 2012. ^ "Bloomberg Says Interpretation of Constitution Will 'Have to Change' After Boston Bombing". 2013-04-22. ^ a b Bloomberg, Michael R. (27 July 2016). "The Independent's Case for Clinton". Bloomberg.com. Retrieved 2018-07-26. ^ Allen, Mike (2018-09-27). "Scoop: Michael Bloomberg becomes House Dems' $100 million man". Axios. Retrieved 2018-10-10. ^ "States Get $48M Boost From Bloomberg Charity To Help Meet Obama Climate Change Agenda". International Business Times. 2015-01-21. Retrieved November 11, 2015. ^ Chaykowski, Kathleen. "Ray Dalio and Michael Bloomberg Commit $185 Million To Protect The Oceans". Forbes. Retrieved 2019-04-02. ^ "Secretary-General Appoints Michael R. Bloomberg of United States Special Envoy for Climate Action | Meetings Coverage and Press Releases". www.un.org. Retrieved 2018-05-10. ^ "Mike Bloomberg to lead UN's climate change initiative". New York Post. 2018-03-06. Retrieved 2018-05-10. ^ "7,100 Cities From 119 Countries Join Together in Historic Collaboration to Accelerate Climate Action". EcoWatch. 2016-06-23. Retrieved July 21, 2016. ^ Intelligencer, Daily. "An Exclusive Look at Michael Bloomberg and Carl Pope's Book on Climate Change". Daily Intelligencer. Retrieved 2016-12-23. ^ "Hardcover Nonfiction Books - Best Sellers - May 14, 2017 - The New York Times". The New York Times. Retrieved 2017-08-09. ^ "Bloomberg delivers U.S. pledge to continue Paris climate goals to U.N." Reuters. 2017-06-05. Retrieved 2017-08-18. ^ "Bloomberg Promises $15 Million To Help Make Up For U.S. Withdrawal From Climate Deal". NPR.org. Retrieved 2017-08-18. ^ Tabuchi, Hiroko; Fountain, Henry (2017-06-01). "Bucking Trump, These Cities, States and Companies Commit to Paris Accord". The New York Times. ISSN 0362-4331. Retrieved 2017-08-18. 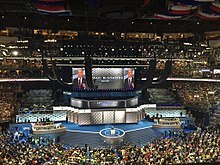 ^ "America's Pledge on Climate Change". Americas Pledge On Climate. Retrieved 2017-08-18. ^ Cam, Deniz. "Michael Bloomberg and California Governor Jerry Brown Pledge To Fight Climate Change". Forbes. Retrieved 2017-08-18. ^ "The governor of California and Michael Bloomberg launched a new plan to fight climate change — with or without Trump". Business Insider. Retrieved 2017-08-18. ^ Tabuchi, Hiroko; Friedman, Lisa (2017-07-11). "U.S. Cities, States and Businesses Pledge to Measure Emissions". The New York Times. ISSN 0362-4331. Retrieved 2017-08-18. ^ a b Goldmacher, Shane (2017-09-19). "As the Clintons Step Back From Global Stage, Bloomberg Steps Up". The New York Times. ISSN 0362-4331. Retrieved 2017-10-18. ^ "The US Government-In-Exile Has A New President". BuzzFeed. Retrieved 2017-10-18. ^ a b "Michael Bloomberg is the new Clinton". Axios. 2017-08-21. Retrieved 2017-10-18. ^ Stewart, Emily (2017-09-20). "Bloomberg Claps Back at Trump at Inaugural Business Forum". TheStreet. Retrieved 2017-10-18. ^ a b "Conservative Billionaire Richard Scaife Tops List of 50 Biggest Donors". The Chronicle of Philanthropy. 2016-02-09. Retrieved February 11, 2016. ^ Kim, Jeanhee. "The Shed at Hudson Yards event is like a Bloomberg-era reunion". Crain's New York Business. Retrieved 2017-08-09. ^ "Michael R. Bloomberg Donates $75 Million to New NYC Arts Center, The Shed | Playbill". Playbill. 2017-05-24. Retrieved 2017-08-09. ^ Pogrebin, Robin (2017-05-24). "Michael Bloomberg Gives $75 Million to Shed Arts Center". The New York Times. ISSN 0362-4331. Retrieved 2017-08-09. ^ "Mike Bloomberg and others donate $125 million for breakthrough cancer research". FastCo News. 2016-03-29. Retrieved April 15, 2016. ^ "Johns Hopkins launches cancer research center with $125 million from Bloomberg, Kimmel, others". The Hub. 2016-03-29. Retrieved April 15, 2016. ^ Barone, Joshua (2016-10-18). "Michael Bloomberg Gives $50 Million to Museum of Science, Boston". The New York Times. ISSN 0362-4331. Retrieved 2016-11-04. 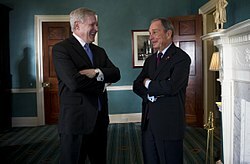 ^ "Michael Bloomberg Donates $50M to Boston Museum of Science". The Forward. Retrieved 2016-11-04. ^ "Museum of Science changed Michael Bloomberg's life. He gives back with a $50 million gift". BostonGlobe.com. Retrieved 2016-10-18. ^ "Michael Bloomberg may be Big Tobacco's biggest enemy". Washington Post. Retrieved 2016-12-06. ^ "Bloomberg's Bermuda". The New York Times. 2015-08-22. Retrieved January 20, 2018. ^ "200 most influential philanthropists in the world". Naij. 2017-03-31. Retrieved March 31, 2017.